Here i got anther economy made 91mm 3.36.00 to the right. The knife on the left is a larger model 3.36.11. I used that model because it is the one that is closest to the year of manufacture. Basically they have all the signs of being 1980-1985 with an additional two years up. The knife to the right and left I would believe is from 1981 + two years at most. It is not difficult to see that the hot stamped emblem in silver color are different is size. The left one is larger and I measured it to be a significant difference. All this I have discussed before about the variations not only in years of manufacture but also differences in the production. There are many reasons for why it could be so. Mainly for me this emblem because it is hot stamped have protection and variations on purpose. It is different for a good reason. I used a digital caliper to measure the main blade to be 2,4 mm on both. Both got the tang stamp that is used from 1980 up to the big V change in 1986. They do not have a 90 degree lock use on the screwdriver. No eye in the awl either. Well these are factor that cannot be taken with a 100% guarantee when it comes to this line of knives. It is better to follow the tang stamp and how the SAK looks all together with all the small details you can find. The emblem is one of the key factors as well. Another thing is the stamp modules used and the differences in them and here there must be many modules used. In the evolution of this line of knives you can also find obvious stamp changes that involve the backside tang stamps and the crossbow. If you look on them you can see the crossbow itself have changes and the cross next to it got differences. On some the cross is connected to the crossbow and on some not. To find out if two knives are very close to each other in year of manufacture you can see how they look very similar everywhere and how the functions got the same grind and the design of the springs, functions and so on. With Victorinox you have a constant development in the production that is the reason for the evolution itself. The obvious design changes with additional functions are also part of the quality development. In the 1970s and at the first half of that decade the economy made knives had some quality problems. From the late 1970s and up this line of knives got much better. At times Victorinox used the two different hot stamp emblems side by side so you will find both very close to each other in year of manufacture. 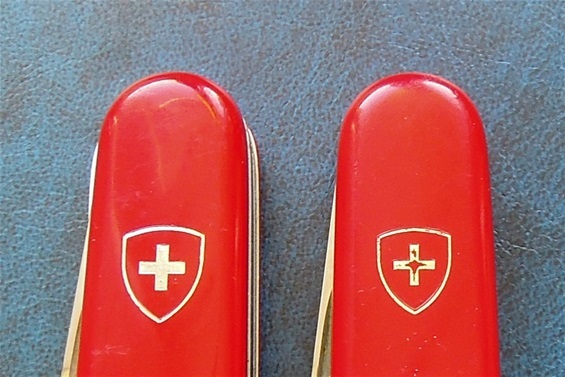 Mainly Victorinox used the left type in the 1980s. That said the smaller one reappears from time to time and it is later used very similar to the pad printed one or colored one. The hot stamp type in this design was used until 1994. Mainly used 1979-1994. That said the hot stamp in a very similar form entered in the early 1970s that is even a bit wider with a few other differences. The color of the handle scales are also different.